As one can see in the video, the artist’s chosen language for understanding and capturing human emotional data is sound. This presents an entirely different medium for understanding than is the norm—over the last few centuries visual interpretation has stood out at as the most popular way to represent information. It has been proven that audio relates more to a person’s emotions rather than any other sense. Even as one closes their eyes it is impossible to escape sound, it can be ever present and ever influencing. Briefly mentioned above, the sounds emitted from EmotiScan are based on data from MRI brain scans and are reminiscent of the sounds heard while connecting to the internet with a dial-up modem. It becomes very interesting when one attempts to comprehend how the audio is understood, especially by this imagined digital consciousness. EmotiScan was produced in a time when revolutions in technology were making it possible for scientists to “look” deeper into the human mind. Although the scientific breakthroughs have been significant from a sensing standpoint the brain is still a mysterious entity, especially the part that deals with consciousness. Kristin Stransky is one of several artists who possess the curiosity to incorporate the brain into their artistic practice in order to investigate the implications of these breakthroughs and to use the brain as an interface for interactive artworks. The question of how an “imagined digital consciousness might try to understand and capture human emotional data” is rather interesting and one considers the answer as enigmatic and mystifying as the sound that is generated when a user dons the device. Nevertheless, it is intriguing for one to imagine an answer to how this fictional entity may interpret human emotions. 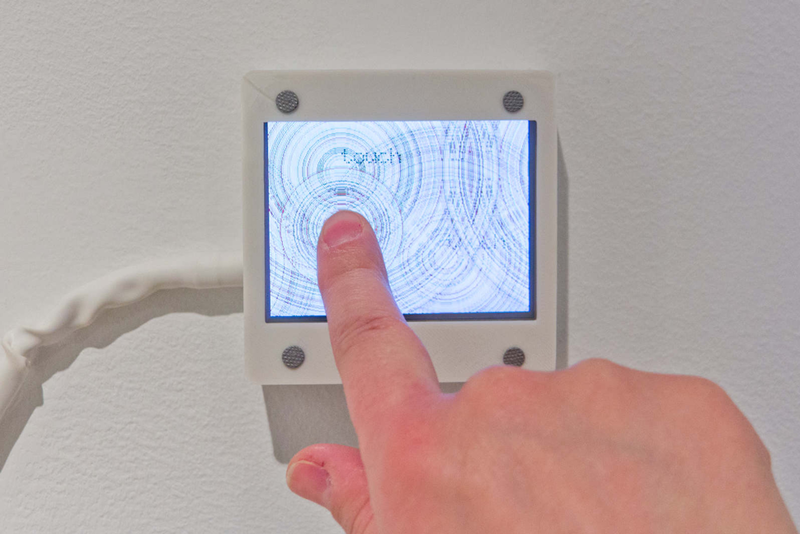 Considering the Internet as the core of this digital consciousness, it has at its fibertips—fingertips seemed inappropriate for a connected digital entity—an unlimited archive of data from which to refer and interpret the emotion of the participant. Therefore, it is feasible that it would be rather simple for a digital consciousness to have the ability to understand and capture human emotion. That being said, the how is the more interesting part of this inquiry. If one speculates it seems logical that a digital consciousness would understand emotion in the same way that humans communicate emotion, through sound, and thus it would capture and express it as such. The artist has done a wonderful job of aligning with a similar speculation and using a sonic output for this piece. Consciousness, digital or otherwise, has been a discussion of both art and science for many years and one hopes it will continue as such. According to a personal interview with the artist, the two hardest parts of this project were caused by limitations in the brain scanning technology available in 2014 and the iterative process of 3D printing. Since speculative design is a major part of the artist’s practice it is easy to see that she is always looking at the next iteration; trying to understand and imagine what more advanced technology will allow in future versions of her work. 3D printing is a wonderful tool that allows for more rapid prototyping of ideas, especially when it comes to the wearable form. While there are occasional failures, each print helps to move toward a working prototype, a finished product, and even improved versions of the initial creation. As brain scanning technology progresses more and more, Kristin’s hope of actual emotion capture could soon become a reality. It will be interesting to see how EmotiScan will evolve when she gets her hands on this type of sensing technology. Unlike EmotiScan, this piece leans more towards an instance of fashion; taking on a form that is similar to that of clothing. With this idea of 3D printing as a fabric replacement, it appears to one that the artist is attempting to close the gap between technology and basic garments, to provide a more personal and invisible connection to meaningful technology. Luciana Haill is another artist who has been experimenting with using EEG’s in her creative practice and much like Kristin Stransky’s EmotiScan, she is looking at possible relationships to consciousness. Her piece Flickering Phrontesterion is also a participatory artwork and features generative sonifications and dynamic sculpture. 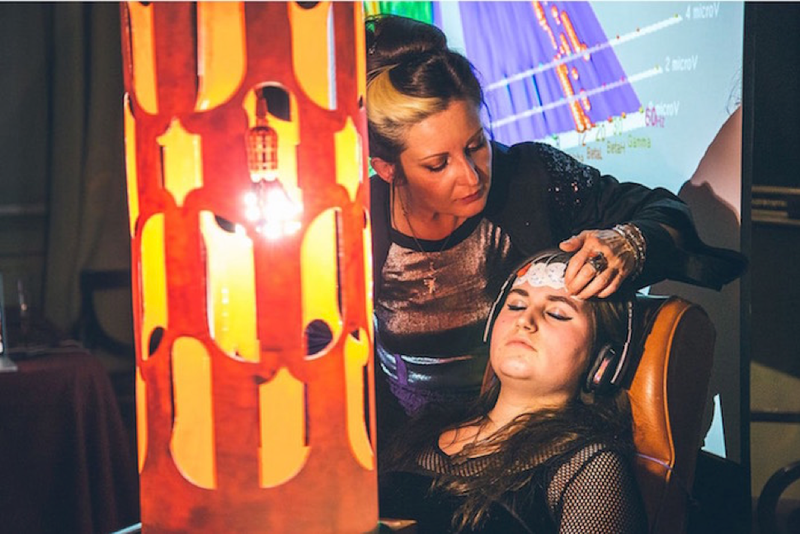 This piece also sparks existential conversations of consciousness in a digital age by transporting participants into a meditative state and then using one’s own brainwaves to adjust the audio, which is a unique soundscape known as “I Am That I Am.” Each participant has a different experience and is presented with “dynamic remixes in the room of guiding voices, anthropological and esoteric discussion of the sleeping soul and depending on their neurological response… quotes from The Surrealist Manifesto.” Flickering Phrontesterion also seems to put a priority on the research component as Haill’s assistant gathers survey-like information from every participant. Dark Matter, on the other hand, is a piece by Morehshin Allahyari that uses 3D printing to address contradictions present in current cultural and political ideology. In this piece, much like many of her others, the artist sparks a conversation around physical vs. digital exile, political and cultural censorship, and the acceptance of new technology in developing countries. Unlike EmotiScan, Dark Matter is an attempt to wake the subconscious of its viewers, to provoke thought and ideas about the limitations and boundaries that are present in countries with restrictive ideologies, specifically Iran. These issues can be delicate but Morehshin is able to approach them from a playful angle and successfully present a way forward. The versatility of 3D printing with respect to artistic expression is truly astounding and both Kristin Stransky and Morehshin Allahyari show that with the right conceptual intent little pieces of plastic can have a huge impact on several different levels—whether they be emotional and existential or cultural and political. A method of digital fabrication that typically creates unnecessary waste becomes a powerful and critical tool in the hands of these incredible artists. Saldo, Carrie, (4.24.14 ), Ready For Art from Robo Renoir Or A PC Picasso?